A lovingly made, exemplary mini-kit with a great snare but held back by a couple of design flaws and a high price. Fantastic snare. Bass drum projects well. Interesting design. Wooden hoops and claws on the toms hinder playing. Expensive. The shells are round to within 1mm - which is top class. The vintage style wooden hoops stick up over above the heads and the claws stick up slightly over the hoops. The snare sound is controlled but lively - it snaps, crackles and pops. Dave Carrera, aided by Mike Worthington, has been making drums in Chesham, Bucks for something over a year. "Leaving school I was in the army, but getting shot and stabbed soon put paid to that!" he says. "I came out and did City and Guilds carpentry and joinery, then I jumped on the IT bandwagon. For 25 years I looked at drums and thought, I can make these. But life, drink, women, gigs all took over!" 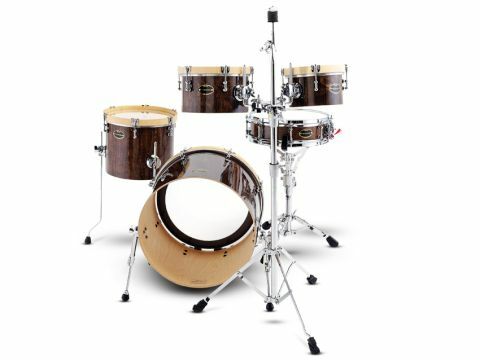 "The lovingly constructed vertical ply shells and the excellent finishes bode well for the future of Carrera drums." We gave Carrera's first snare drums a glowing review earlier in the year. Now we have a lightweight kit designed specifically to project on smaller gigs where space is tight. The basic Terrier kit is a three-piece comprising 18"x14" bass drum with riser, 12"x10" floor tom with legs and 10"x6" rack tom. Dave has added to this an extra 8"x5" rack tom, with different shell construction and also the original Terrier snare. Shells are made from grade A Finnish birch, 12-ply and 6mm thick, except for the 8" tom which is 6-ply and 3mm thick with 3mm reinforcing rings. They are constructed so that all 12 plies are aligned vertically. This is said to aid rather than hinder the progress of soundwaves down through the shell. The reason that most conventional shells have alternating cross plies is to make the shell stronger and more stable - plus it's easier to cut a smooth bearing edge on the horizontally-laid inner and outer plies. All bearing edges are cut to 45° with a small cut-back, flattened off on top to 0.5mm then sanded and waxed. Although there are no bottom heads, Dave has cut bearing edges top and bottom. "Just showing off," he jokes. But it would enable a bottom head to be added at some later stage if you wanted. Carrera's shells are accurately round to within less than 1mm - which is top class - and they are blemish free. As much care is taken on the inside as the outside. The bearing edges are precise and the lacquered finish is superb. One thing that sometimes lets down small craft shops is the lacquering, which simply lacks that glassy sheen attained by the big boys. No such problem here - the Dark Teak stain and high gloss lacquer of the review kit is Rolls Royce-glorious. Finishing off the shells there is an oval black and gold badge which states 'Carrera Terrier, Hand Made in England'. Each shell is stamped inside and signed with a serial number. The review kit is the first Terrier kit and thus has the serial number 0001. All this is good. For us, then, it's a shame that the kit came with wooden hoops. They are deeper than you would normally experience with metal hoops and are held down with claws and tension bolts via twin-point mount short-tube lugs. The lugs are solid but the claws are those old-style generic ones with iffy-looking chrome plate. The effect could be cutting-edge but actually looks curiously old fashioned, like the cheap single headed drums companies used to sell as their starter ranges. With the snare we're back on more-than-solid ground. It's a 13-inch x 3¾-inch piccolo fitted with eight double-ended tube lugs and a good quality generic throw-off. The wires are the redoubtable WorldMax 20-stranders, though Carrera says he's now moved on to Fatcat or PureSound wires. This is a tasty little snare that looks top quality. So how does it sound? The answer to that is brilliant, in every sense of the word. But let's start with the whole kit. The Terrier is lightweight and small, a dream to transport. Set-up takes minutes and uses up considerably less floor space than a standard kit. Perfect for smaller clubs and pubs, which is the idea. The toms are small, but actually not that much more than is common these days. And small toms do bite. The single-headed sound will always be more attacking, shorter and faster than the more rounded sound of double-headers. Carrera is adamant that the vertical ply alignment of the birch plies aids projection and makes the sound even more direct and punchy. We found that the toms had a tendency to boom and rumble with a sort of natural pitch bend. The vertical ply shells are certainly lively, resonating freely, adding to the sustain and body. It's a different sound, but our problem again is with the wooden hoops. Being high profile they stick up over ¾-inch above the heads. Then the claws stick out slightly over the hoops. The combined effect is twofold: to avoid catching the rims and claws you are forced to strike the heads at a greater angle than usual - around 25°+, particularly on the two smaller toms. As a result the heads on the review kit got pitted because the stick tips gouge them instead of striking close to flat. Not a problem on bigger drums, but these are all tiny toms. Some wooden hoops, like Yamaha's vintage hoops, have recessed bolt heads and shallow profiles closer to normal metal rims. This type would have been a better, more contemporary choice. The alternative is for Carrera to fit standard metal hoops (which Dave will happily do on request with no price difference). That whinge aside, the toms do punch above their weight. As does the bass drum. It is also single-headed and we're all used to bass drums with holed front heads anyway. Fitted with an Evans Emad we found it performed best with the foam ring removed and the head tightened just enough to take out the wrinkles - ie: pretty slack for maximum bottom-end and slap. Sitting behind the drum it's not so evident but standing a little way in front you realise there is surprisingly good clout and warm tone. The ace in the pack though is the snare. More conventional with its two heads and triple flanged hoops, it's a little cracker. At 13"x3¾" it is a true piccolo and since it doesn't ring too much there's no need for dampening. The sound is controlled but lively; it snaps, crackles and pops whether you use it as an edgy main snare or ideal second snare. Funk, jazz, drum'n'bass are obvious uses, but tuned down it has enough body and slap for rock too. The Terrier is a different concept, the result of Dave Carrera's long-held passion for building unique drums. We found the deep wooden hoops and claws a hindrance given the small tom sizes. And for a portable mini-kit the Terrier is expensive. Anyone needing a compact gigging set could find a Sonor Jungle or Pearl Traveler for much less. A shame, as everything else, particularly the snare, is exemplary. The lovingly constructed vertical ply shells and the excellent finishes bode well for the future of Carrera. We're looking forward to seeing Carrera's first full-sized kit.